First shown here in 2015, Jarda’s gorgeous Tatra 815 has been updated in red for an upcoming Lego exhibition in Denmark. With Power Functions remote control drive and steering and beautifully replicated detailing Jarda’s Tatra is amongst the very best Lego trucks on the ‘net. Jarda’s update also allows us to showcase something that we overlooked previously; this 815 can tip in two directions. How this works is beyond the collective mind of TLCB staff but it appears to do so brilliantly. Click here to head to Brickshelf for the complete gallery of superb images. No, this TLCB staff member hasn’t titled this blog post from recent self experience, and he’s not thinking about you at all Amelia. Coincidentally today’s creation is, like Amelia, capable of a sizeable dumping. 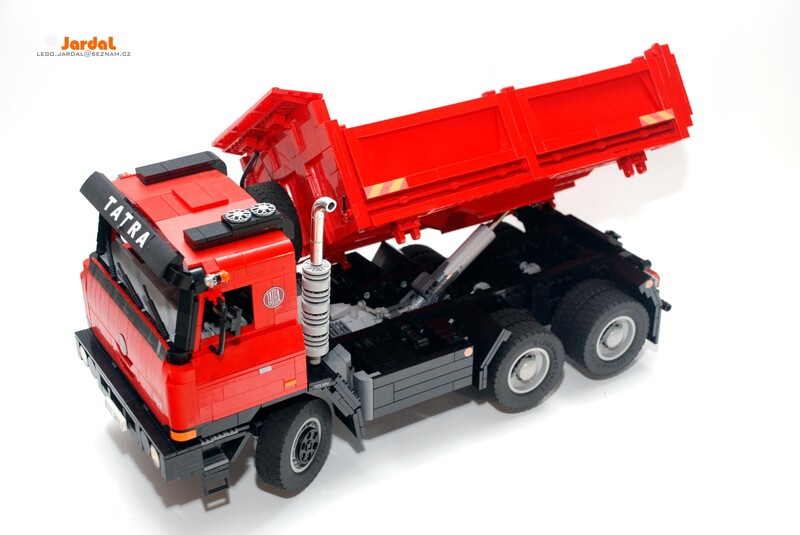 Built by previous bloggee Damian Plesniak (aka damianple) this neat European truck and tipper trailer combo could be an official LEGO Technic set, and contains some excellent motorised functions. The tractor unit features remote control drive and steering, whilst the large three-axle trailer’s tipping function is motorised too, with power coming from a battery box concealed within the truck’s cab. Damian’s model also features manually operated stabiliser legs, opening doors, and a reasonably detailed (for Technic) interior too. There’s more to see of Damian’s remote control truck and dump trailer at both Flickr and Brickshelf. Join this writer at the complete image galleries via the links above, where he’s already totally forgotten a recent dumping. This delightful vintage tipper truck was discovered by one of our Elves on Flickr today. It comes from Versteinert MOC and it’s packed with brilliant detailing, including chassis details normally overlooked at this scale, such as an exhaust, spare wheel, gas tank, prop-shaft and even a differential casing. There’s a whole lot more to see at Versteinert MOC’s Flickr album – take a look via the link above. Nope, not your Dad’s browsing history but this, Dennis Bosman’s incredible Scania T143H bulk hauler, with not one but two enormous tilting hauler bodies behind the cab. Based on a 1994 Scania T143H used in Nieuwveen, the Netherlands, a truck which racked up over 2,300,000kms in seventeen years of service, Dennis’ model replicates every aspect of the real truck, including an wonderfully accurate recreation of the original livery. Both tilting bodies are operational, powered by an XL Motor hidden within the truck unit (with a power-take-off for the trailer) and a linear actuator mounted underneath each tipper. The truck itself is also remote controlled, with both drive and steering operable via a bluetooth device thanks to a third-party SBrick bluetooth receiver. There’s a lot more to see of Dennis’ stunning Scania T143H on Flickr, where you can also see images of the real truck on which his model is based. Head over to the Scania’s album by clicking here, and you can read our interview with the builder as part of our Master MOCers series by clicking here too. Such is the success of LEGO’s excellent Power Functions system that we rarely seem to publish a purely mechanical Technic model. 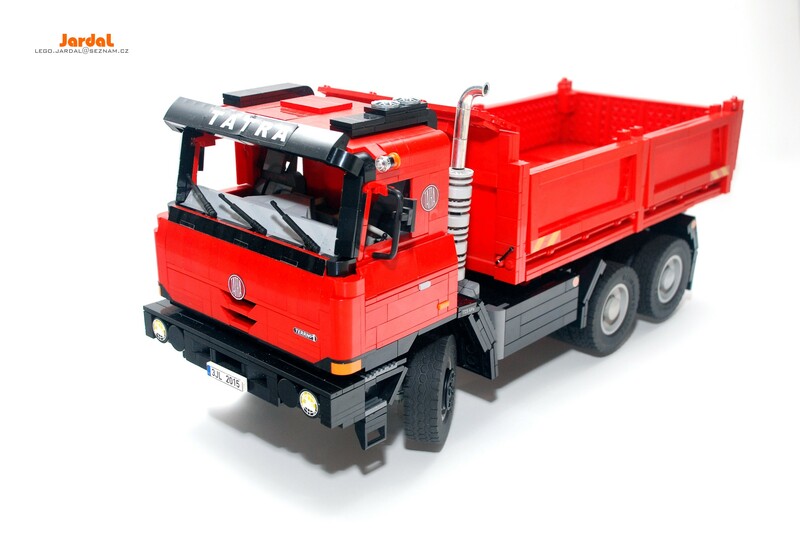 However recent bloggee Nico71 has allowed us to do just that with this superbly executed tipper truck. Mechanical functions include a 6-cylinder engine driving (or rather being driven by) the rear wheels, working Hand-of-God steering, and a hand-cracked tipping load bed. We think Nico’s model could easily be an official Technic set, and there’s more to see courtesy of his Brickshelf gallery via the link above. We have a happy TLCB Elf in the office today. Contentedly munching on an orange Smartie (they’re the best kind), it found this brilliant mechanical-only Technic Mercedes-Benz Arocs tipper truck. Yup, mechanical only – meaning Thirdwigg’s Arocs tipper has completely eschewed Power Functions remote control for good ol’ fashioned hand-powered gears. This meant no Elven mayhem, no smushing, and a quiet and peaceful day for all. The Elves even seem to be enjoying this unusual state of affairs, but we’re sure that’ll change soon. Thirdwigg’s truck hasn’t eschewed functionality alongside electric power though, and it’s packed with all the working functions you’d expect a Technic model to have, including four-wheel steering, a working piston engine, a tilting cabin with opening doors, and a linear actuator controlled tipper mechanism. We think Thirdwigg’s Arocs tipper truck would make a decent official Technic set, and you can see more of his build at both his Flickr photostream and via the Brickshelf gallery here. Another day, another find, another Elven catastrophe to tidy up. Following this week’s earlier Elf squashing our workforce has been in a cautious but nevertheless vengeful mood. And so one of the week’s earlier victims found itself at the controls of a vehicle capable of exacting a hit-and-run based revenge. With the Elves it doesn’t really matter if the perpetrator of a previous act is actually present when the revenge is served, just as long as someone gets squished. And squished they were. The vehicle in question is this absolutely wonderful ZiL 130 MMZ 555 tipper truck, in perfectly-suited Porsche 911 GT3 orange, as built by previous bloggee Samolot. In a convenient metaphor for the communist economy that spawned it, the Zil was the ideal tool for crushing the people, or in this case, Elves. Remote control drive with a remotely controlled four speed gearbox, and a novel linear actuator based steering system give this ZiL 130 a surprising turn of speed, certainly enough to catch out a few slower Elves, whilst all-wheel suspension allowed the truck to roll over them with ease. Unrelated to the smushing, but a cool feature nonetheless, Samolot’s Zil 130 also includes a remotely controlled dumping mechanism powered by a Medium Motor, taking the total motor-count to four. Opening doors, a working steering wheel, and an opening hood all feature too, and Samolot has included a level of detail that’s now becoming typical with many Technic builds that moves the theme ever closer to Model Team in terms of aesthetics. There’s a whole lot more to see of Samolot’s superb ZiL 130 dump truck via Brickshelf, MOCpages and the Eurobricks forum, plus you watch all the working features in action courtesy of the excellent video below. In contrast to today’s other post, this model is as smooth as it gets. The other post featured a model from the ’70s, and whilst we’re sure there’s a metaphor for that one being decidedly un-smooth we’re not sure we can write it here. We’ll let you use your imagination instead. Anyway, on to his model. This incredibly slick Scania 8×4 tipper truck is the work of Robert Heim of Flickr, and it is quite remarkably smooth. There’s a tipping function too and one of the most beautifully constructed load beds that we’ve ever seen at this scale. There’s more to see at Robert’s Flickr photostream where there’s a wealth of stunning Lego photography on offer. Click the link above to take a look. Previous bloggee pipasseyoyo of Brickshelf returns to The Lego Car Blog with another top quality Technic creation. His latest build packs in no less than six Power Functions motors to drive the truck’s steering, propulsion, and trailer hitch, plus the trailer’s support legs and tipping mechanism, and – as we discovered – it’s able to transport a whole troop of Elves outside and then dump them in the hedge. You can see the full gallery via the link above, where you can also find a link to watch the truck and trailer in action. This stunning pair of huge Model Team style classic DAF trucks comes from TLCB regular and DAF specialist Arian Janssens. His two latest builds up the detail level once again, and make Arian one of the best Lego truck builders anywhere in the world right now. On the right, and shown with the load bed raised to its highest point above, is Arian’s GINAF F530 10X4 tipper truck. *Not strictly a DAF, GINAF were a Dutch truck specialist that used DAF trucks as the basis for their conversion to heavy duty applications. In business since the late 1940s, GINAF produced around 250 specialist trucks a year. However modern economics mean manufacturing in such low numbers is no longer enough to survive, and GINAF filed for bankruptcy in 2011. The second truck in Arian’s pairing is this superb classic DAF 2800 in an unusual-for-Europe long-nose specification. Like GINAF, DAF have experienced some difficult trading times, and filed for bankruptcy in the early 1990s following the collapse of their merger with British Leyland. A management buyout restarted the firm and in 1996 DAF were bought by the American giant PACCAR, who then also bought Leyland, re-merging the two firms once more. DAF trucks are now commonplace across Europe, but few modern DAFs look as interesting as this classic 2800 does. You can see more of each build at Arian’s Flickr photostream – click the link above to make the jump. You don’t need 4,796 LEGO pieces to appear here at TLCB, because we love small creations too! One of our favourite Town scale builders, Flickr’s Smigol, recently uploaded a herd (what’s the collective term for trucks?!) of small-scale haulers. Each is an easily recognisable recreation of a real world truck, including a DAF CF tipper truck (top), a pair of Mercedes-Benz Arocs heavy-haulers (middle) and a DAF CF complete with cherry-picker load (below). There’s lots more to see of each build plus Smigol’s other fantastic Town creations at his Flickr photostream – click this link to make the jump.